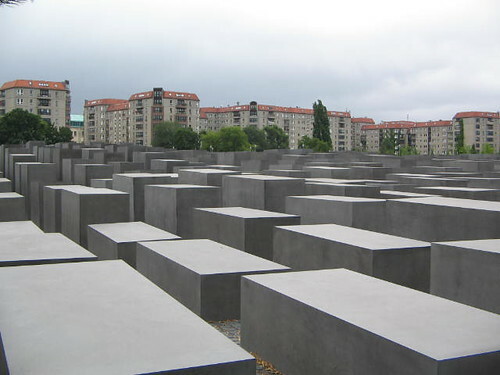 Memorial to the Murdered Jews of Europe, originally uploaded by tgtwb. Memorial to Jewish victims of the Holocaust are grey concrete slabs, probably about 2 to 4 metres long with varying heights. Called the "stalae", the slabs are designed in such a way to emote unfamiliarity, unease, confusing atmosphere, representing an ordered system that has lost touch with human reason. The memorial's inaugural opening was sometime in May 2005 (which was around the same time that TTT was there). Located near the buried remains of Hitler's underground bunker and the Brandenburg Gate, the memorial has sparked its fair share of criticisms and controversy - from the memorial remembering only the murdered Jews to the lack of representation of German guilt. A recommended tour is the 4-hour long Berlin-Walks tour, that will take you to these places and offer interesting insights (from mostly non-Germans living in Germany! ), and cost approx. 10 euros each. Admission for this is free of charge. A good thumbs up and worth a good walk, even though you may not feel directly sympathetic towards its real cause. Booyah! All Cubbies Need To Eat And Got To! Angkor Wat & The Temples of Angkor - PART ONE!